The Yankees now have 97 wins for the season. That ties 2011 for their most since 2009, and we still have five more games to go. It’s remarkable to think that this could be the winningest team since the latest championship considering not a lot of things clicked in the cylinder this year. Anyways, just like last night, it was a relatively easy one. The offense set the tone in the third by pushing across 7 runs off the Rays bullpen. Luis Severino had a good outing – not necessarily classic Severino one – that gave enough reasons to be optimistic moving forward. The Yankees’ magic number for clinching the home spot for the AL Wild Card game is now at three. All the good rallies start with the soft-hitting defensive shortstop. To lead off the inning, Adeiny Hechavarria got a fastball low inside corner and golfed it just above the left field fence for a solo homer. A backup shortstop breathing life into the offense is pretty cool, but how about John Sterling’s call? The beat didn’t stop there. Brett Gardner followed it up with a triple down the first base line and Andrew McCutchen walked to put runners on corners. Up came Aaron Judge and he hit the hardest liner (109.0 mph) of the inning … which was caught by the pitcher Jake Faria. And thank God, because it was going straight to the pitcher’s head and his glove happened to be at the right position to catch it on fly. It’s cool when Aaron Judge is able to drive runs in, but, in that moment, you gotta be glad for Faria being able to protect himself. Kevin Cash decided that that would be it for the Rays starting pitcher and put in Andrew Kittredge. The Rays went on to pitch to Luke Voit. The beefy first baseman made them pay by lining a double down the line to score two more. After intentionally walking Giancarlo Stanton, Cash put in Jalen Beeks, a pitcher they brought in for the Nathan Eovaldi trade with the Red Sox. With bases loaded, Neil Walker drew a walk to push another run across, and Miguel Andujar followed it up with a sac fly to make it 4-0. Think the Yanks were done there? The ninth batter of the inning, Gary Sanchez, who had been struggling prior to tonight, got a hold of Beeks’ 92 mph fastball down the zone and drove it out of the park for a three-run home run. Boy, did Sanchez need that. He also had the best offensive night in many moons, and we’ll get into that later. I’ll count this one as a good night for Luis Severino. He had one dicey inning where he allowed two runs (could have been three if it weren’t for the Rays’ blunder decision to send Ji-Man Choi to home that resulted in an easy out) but there were a lot of positives. Well, a big chunk of that is that he was missing bats. He got 17 whiffs (fourth-highest of the season) out of 97 pitches and got 7 strike outs in 5 innings. Eleven swings and misses were from his heater, which is always a positive. 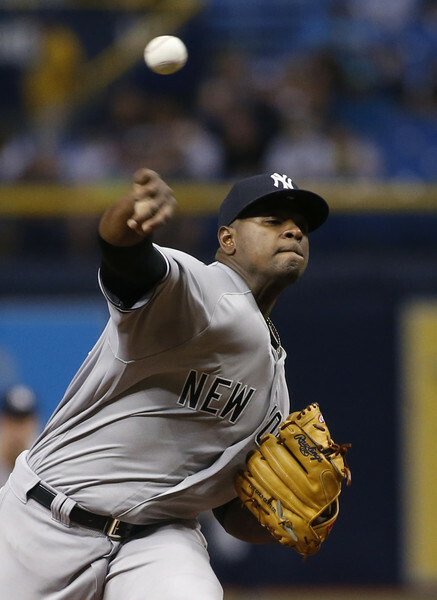 As it is true for many pitchers, Severino needs his fastball to be effective to have a successful outing. Remember when he had a terrible stretch mid-season? His fastball, despite having that velocity, wasn’t really missing bats. Cause for concern? He did lose the command for a hot second in the third. He started the inning by allowing a double to deep right to Joey Wendle. On the next pitch, Sevy plunked Tommy Pham on the elbow. He followed it up by walking Ji-Man Choi on five pitches. Brandon Lowe, who had a 3-for-3 night, squared up on a fastball middle-middle for a two-RBI double. 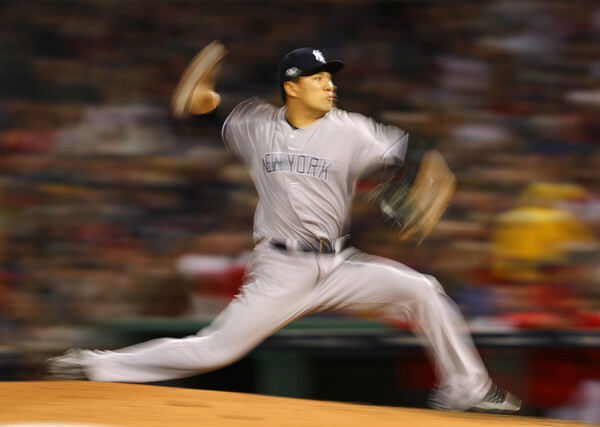 The Rays gave Yanks a free out by waving Choi home for an easy out. C.J. Cron lined out to Hechavarria for the second out and Kevin Kiermaier grounded out to end the frame. There were some hard-hit balls in the inning and Sevy ran into some luck to close it out, but you do have to consider that even the hot pitchers run into a bad short stretch once in awhile. The rest of the outing was good enough to give Severino some benefit of the doubt. Even though Severino doesn’t look like his first-half dominant self, there are reasons to believe in him in a postseason start, especially given the turnaround he’s had in his previous seven starts. For the Yankees’ sake, let’s hope it’s a trend. The Yankees tacked on two more runs for rest of the night. 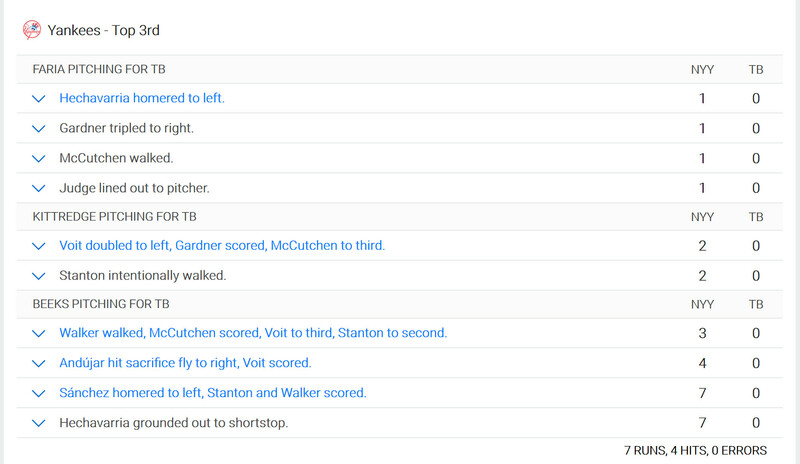 In the fifth, Stanton led off with a frozen-rope double (112.2 mph) down the left field line. Walker’s ground out advanced him to third but Andujar failed to drive him in by popping out to catcher. 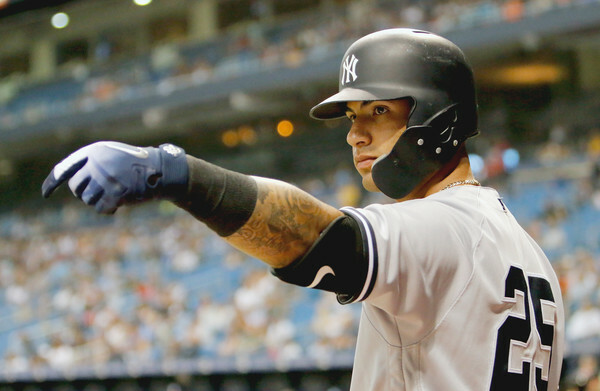 Don’t worry, here comes Gary Sanchez. 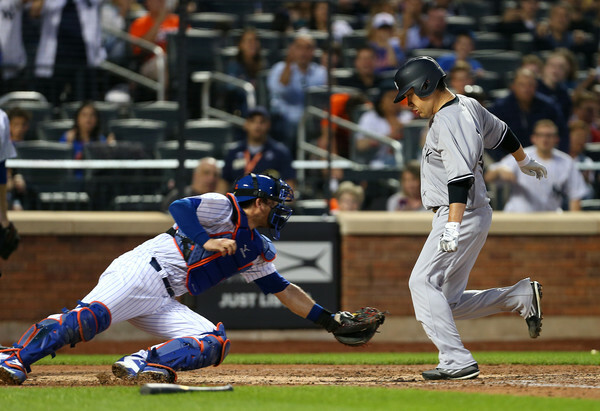 The Yankee catcher pulled a single to left for his fourth RBI of the night. All in all, Sanchez went 2-for-4 with a walk and 4 RBI’s, which is… definitely more like it. Believe it or not, it’s his first game in more than three months in which he drove in more than two runs. Given on the caliber of hitter he can be, that really tells you what kind of year he’s had. I’m not saying it will be, but hopefully, tonight can serve as some kind of turnaround for his season. In the ninth, Miguel Andujar went deep against our old friend Vidal Nuno. That’s his 26th homer of the year and the kid just continues to rake. After tonight, the Yankee third baseman has a .298/.329/.525 line with 71 total extra base hits. 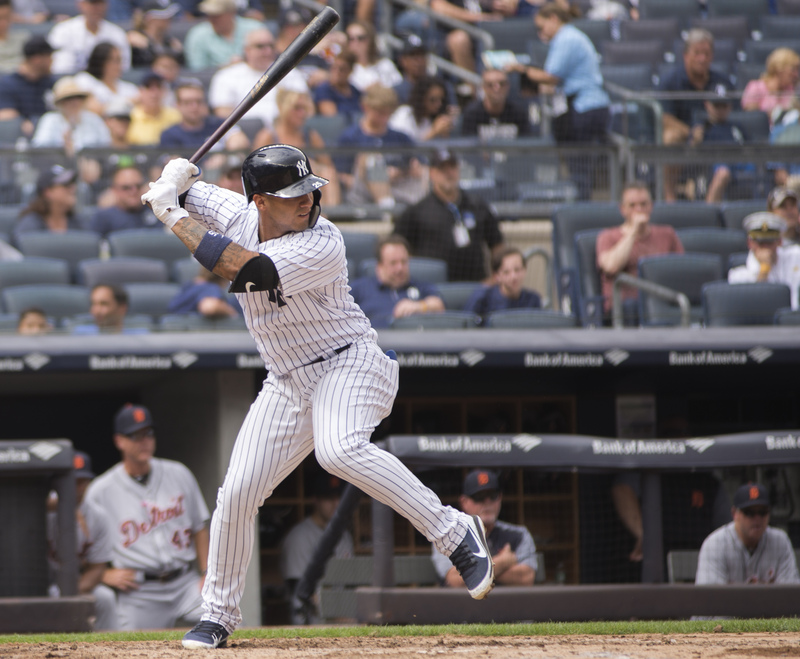 He may win the Rookie of the Year, he may not, but looking at the bigger picture, the Yankee fans got to be excited about how his hitting prowess will develop over the years. On the pitching side, Tommy Kahnle, Stephen Tarpley and Domingo German kept the Rays scoreless for the last 4 IP of the game. Not the names that Boone would use in close game situations, but he had to feel good after seeing what they offered tonight. It seems that, Tarpley in particular, has impressed Boone enough to consider him in the “conversation” for the postseason roster. The series continues tomorrow. 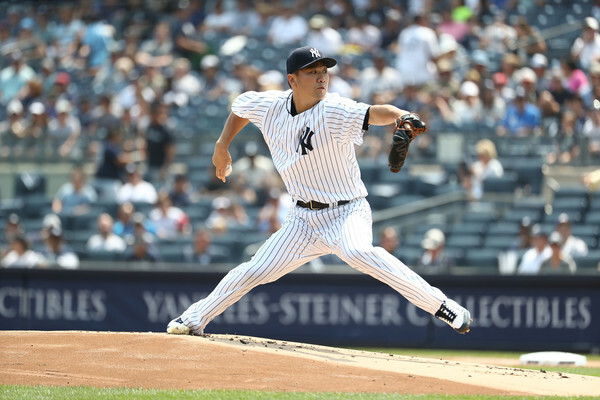 Masahiro Tanaka will be on the mound against the Rays opener Ryne Stanek. 7:10 pm EST start, so it’s the same drill as today. 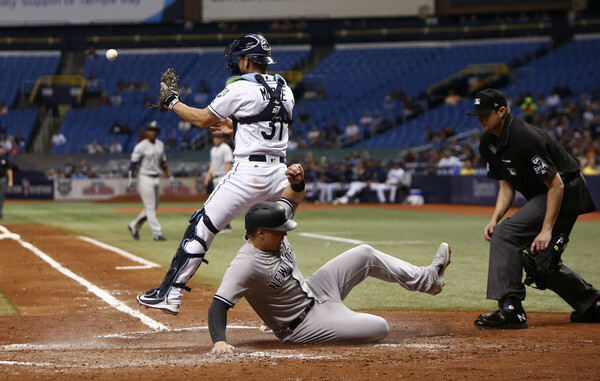 In the battle of the opener vs. opener strategy, the Yankees came out victorious in the first game of the series at the Trop. They not only won the game, but also the magic number for clinching the top Wild Card spot is down to four, and they knocked the Rays out of the playoff race. We will be watching the A’s vs. Mariners score, but for tonight, the Yankees did what they could control: win a ballgame. The Yankees got on board against the second Rays pitcher Hunter Wood. With one out in the third, Andrew McCutchen got a fastball right down the middle and crushed it over the left field fence. Wood had fed him nothing but a steady diet of fastballs and he got a perfect mistake pitch. 1-0 Yankees. 93 up in the zone. Big league hitters can crush that. Heading into the bottom of the fourth, the Yankees lifted Aaron Hicks for Brett Gardner in center field. Uh oh. The Yankees have Didi Gregorius out (for now) with an injury and, because we are nearing the postseason, any sign of injury is a much bigger deal than usual. It turned out that Hicks has a tight left hamstring, so let’s hope it’s precautionary. In a better news, Gardner was involved in a two-run rally in the fifth. With two outs, Aaron Judge worked a walk and advanced to second on a wild pitch. Gardner got a hold of Ryan Yarbrough sinker low in the zone for an RBI single to make it 2-0 Yanks. 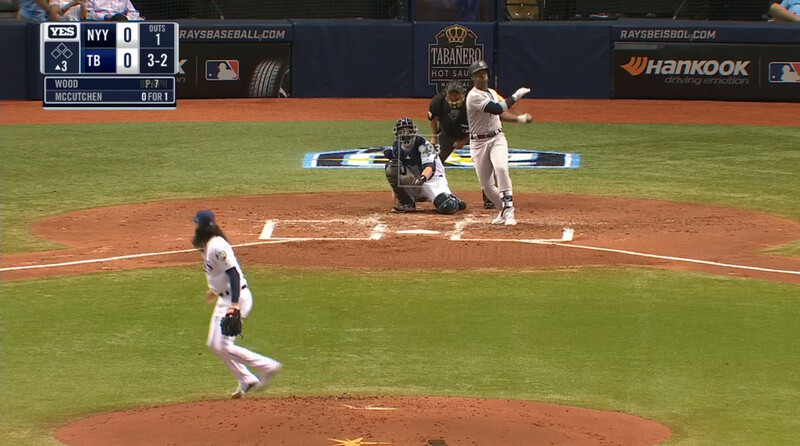 Giancarlo Stanton followed it up with a double to deep left, scoring Gardner from first to make it a two-run lead. Stanton did get thrown out at third trying to stretch it into a triple, but the damage was done. The Bombers added another against Yarbrough in the seventh. With one out, McCutchen and Judge hit back-to-back doubles to put another one on board. This has been repeated in the website, but adding McCutchen has been such a good move for the lineup. We’ve known his pedigree of being a good hitter with the Pirates, but at the leadoff spot, McCutchen has seen tons of pitches. Tonight alone, he saw 34 of them in 5 plate appearances (6.8 pitches per PA), which is insane. Add his ability to see pitches with, well, Aaron Judge, who seems to be in full-count in any given at bat. The Yankees will hope that those two will be catalysts in elevating pitch counts in the postseason. I have no idea how Stephen Tarpley will develop as a major league pitcher. He doesn’t have the high relief pitching prospect pedigree that guys like Chapman or Robertson did. However, he has chance to be useful. There’s always a spot in bullpen for guys that live off a sinker-slider combo. Since is ML debut earlier this month, when he allowed three earned runs against the Tigers, Tarpley has yet to allow another. Tonight’s outing may have been the crispest, as the lefty pitched a three-up, three-down inning with a strikeout. How about the late inning guys? 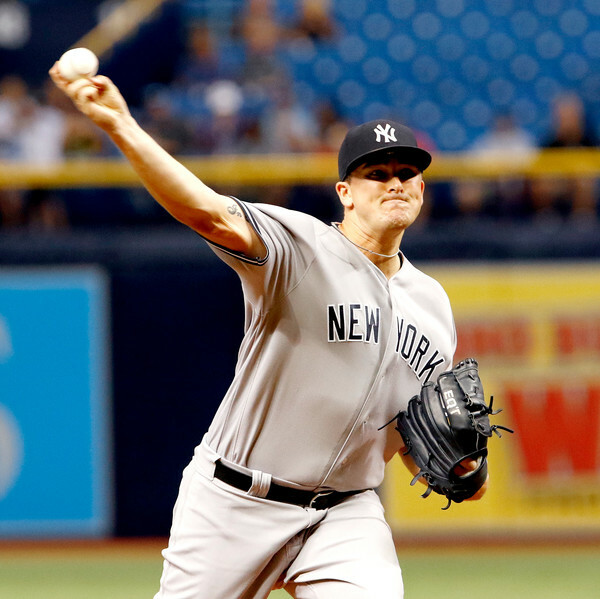 Green, Robertson, Chapman, Betances and Britton combined for 5 no-hit innings with 9 strikeouts. That’s the kind of collaborative effort that the Yankees hoped for when they assembled this group. I would imagine that they will run these arms frequently during the postseason (assuming they win the AL Wild Card game as well). Regarding Aroldis Chapman – eye test-wise, his command looked better than that of his previous outings after coming off the DL. The problem is velocity. It’s weird to be concerned about a guy who topped out at 98.1 mph in an outing, but he did average at 97 mph tonight, which is a tick or two below his usual. He did get two swinging strikeouts on sliders, which is a positive for the Yanks. Earlier this season when Chapman was doing well, he was able to command his slider in the zone or to induce whiffs, regardless of how his fastball fared. It would be a boon for the back of the bullpen if he can jack his fastball velocity closer to 100 and be able to use his slider the way he did tonight. Zach Britton looks really good. I think there’s a possibility that the Yankees assign closing jobs by committee in the playoffs, but Britton has made a solid case to pitch in more save situations. In 9 September appearances, Britton has allowed zero earned runs and zero walks. The further removed he is from the Achilles surgery, the better he looks. Now, enjoy this catch by Gardner that saved two runs for the Yankees in the sixth. The series at Trop continues tomorrow at 7:10 pm EST. Luis Severino will be on the mound for the Yankees against Jake Faria.